Aldin -Dino- Peljto moved abroad in summer 2011. The Dutch midfielder with Bosnian roots signed a 2-year contract at Belgian second division outfit KV Turnhout until 2013. Peljto was educated in the PSV youth academy. In the 2012-13 season, Peljto is playing at KFC Dessel Sport in the Belgian Second Division on loan from Turnhout. 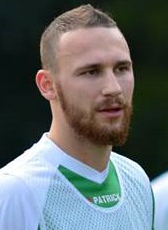 In the 2015-16 season Peljto made a transfer free move to Cappellen FC. A season later he was under contract at Third division club Bocholt VV until summer 2017. On international level he played for the U21 team of Bosnia Herzegovina in 2007.